What are the different types of triggers? What causes my immune system to attack my lungs? Are allergies and asthma triggers the same? Why is it important to know all my triggers? How to test what triggers my asthma? How can I avoid my triggers? Is there a cure for my allergic triggers? 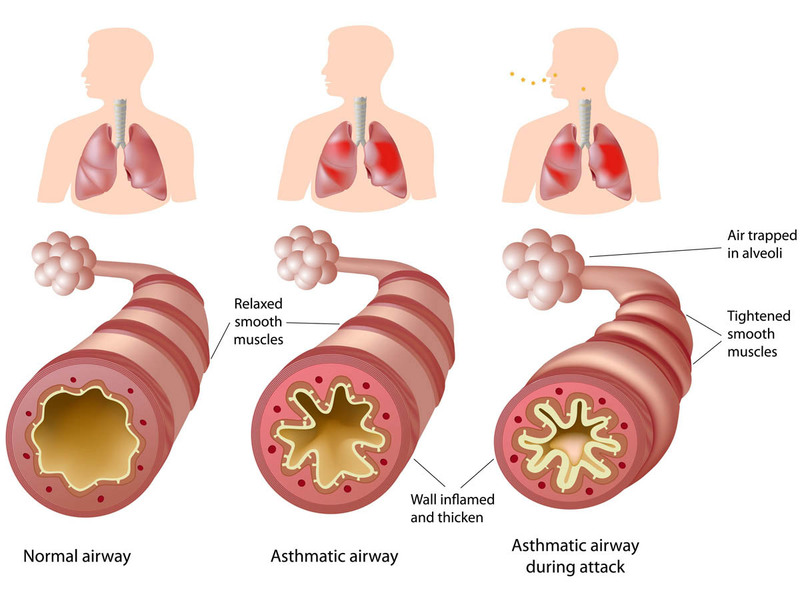 Asthma Triggers are called a trigger since they start a chain reaction that lead to an asthma attack. Asthma Triggers are divided into two main types: Allergic and Non-Allergic. Step 1: An allergic response occurs when immune system proteins (antibodies) mistakenly identify a harmless substance, such as tree pollen, as an invader. Step 2: In an attempt to protect your body from the substance, antibodies bind to the allergen. Step 3: The chemicals released by your immune system lead to allergy signs and symptoms, such as nasal congestion, runny nose, itchy eyes or skin reactions. For people with asthma, this same immune reaction causes an inflammation within the lungs, leading to asthma symptoms. 90% of children and 60% of adults have allergies as their triggers but not everyone with allergies suffers with asthma. Not all asthma triggers are allergy based (see above). Allergies and asthma have many things in common aside both making you miserable. Allergies and asthma often occur together. The same substances that trigger your hay fever symptoms may also cause asthma signs and symptoms, such as shortness of breath, wheezing and chest tightness. Though allergic asthma is very common, there are other types of asthma with different kinds of triggers. For example, for some people, asthma can be triggered by exercise, infections, cold air, gastroesophageal reflux disease or stress. Many people have more than one kind of asthma trigger. 1. Most people with allergies are allergic to more than one allergen. 3. When allergen levels pass the threshold, asthma symptoms appear. Chances are you’re allergic to more than one thing. Allergens add up. Multiple allergens can play a significant role in causing respiratory symptoms. You may be aware of one obvious trigger such as grass pollen for your allergy or asthma, but unaware of allergies to mold, pet dander and cockroaches. Greater exposure to the allergic triggers is more likely to make symptoms worse. 1. Many allergic triggers can be tested. 2. Non-allergic is identified from tracking your asthma history. 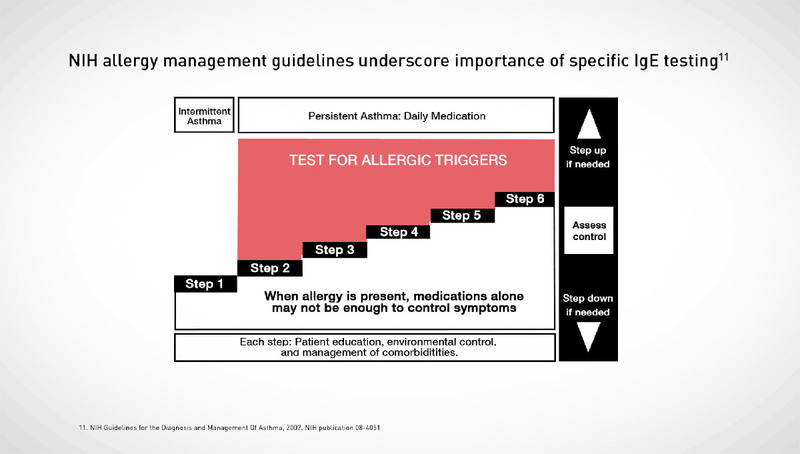 NIH Guidelines recommends a specific IgE blood testing to identify allergic triggers as part of the step wise approach for all patients with persistent asthma. A single simple blood test can test you for multiple allergens at once. Another option is a skin pin prick testing done by your allergist. Ask your doctor which method is best for you. 1. Avoiding triggers may be as effective as asthma drugs. 2. Each type of trigger has a specific avoidance technique. If you smoke, ask your doctor or nurse to help you quit. No one should smoke in your house. This includes you and your visitors. Smokers should smoke outside and wear a coat. The coat will keep smoke particles from sticking to their clothes. They should leave the coat outside, or away from your child. Ask people who work at your child's day care, preschool, school, and anyone else who takes care of your child, if they smoke. If they do, make sure they don't smoke near your child. Wash bedding and pillows once a week in hot water (130°F to 140°F). Wipe away dust with a damp cloth and vacuum once a week. Use a vacuum cleaner with a HEPA filter. Discuss any other possible triggers with your doctor and how to avoid them. 1. immunotherapy may reduce or eliminate sensitivity to some allergy triggers. 2. asthma medication can help control asthma symptoms. If you're one of the millions of Americans with allergic asthma, treatments can help you live a full and active life. Asthma and allergy medication can manage your symptoms well with minimum to no significant side effect (see Asthma Medication made simple for more information). Some people with mild to moderate asthma choose to get allergy shots from a doctor. This is called immunotherapy. Most allergy shots contain small amounts of what you're allergic to. When you get the shots over time, your body gets used to having those substances around, and it reacts less to them (desensitization process). 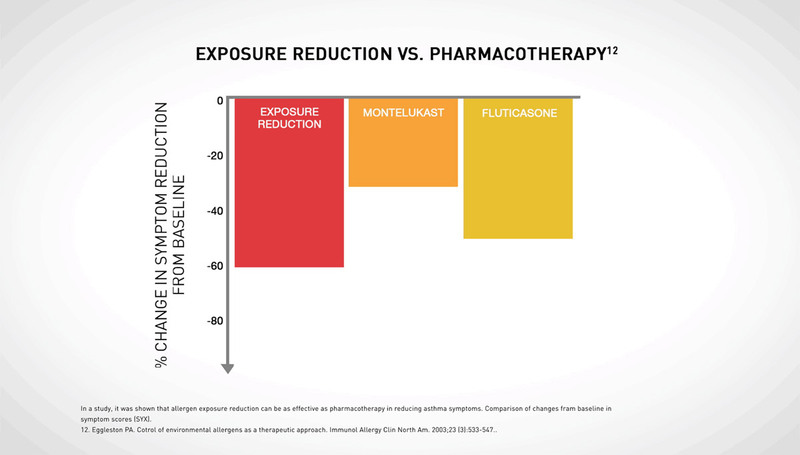 Not only can allergy shots improve your asthma symptoms, sometimes they can prevent a flare. Also, the FDA has approved three under-the-tongue tablets that can be taken at home. The prescription tablets, called Grastek, Oralair, and Ragwitek, treat hay fever and work the same way as shots. The goal is to boost a patient’s tolerance to allergy triggers. There are also other non-FDA methodology such as Allergy Drops (sublingual allergy treatment) that has been shown by over 40 years of data to be very effective and is the primary allergy treatment in Europe and is becoming more popular in US. © 2009–2018 AsthmaMD Inc. All Rights Reserved. Disclaimer: AsthmaMD's health-related information and resources are not intended to be a substitute for professional medical advice or for the care that patients receive from their physicians. Only a physician can diagnose your asthma.